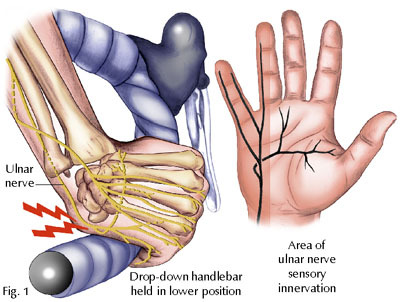 Ulnar nerve compression at the wrist is less common than at the elbow. Compression at the wrist (Guyon’s canal) is usually associated with repetitive trauma or ganglions. A right hand viewed in cross section showing the ulnar nerve and artery traversing Guyon’s canal. 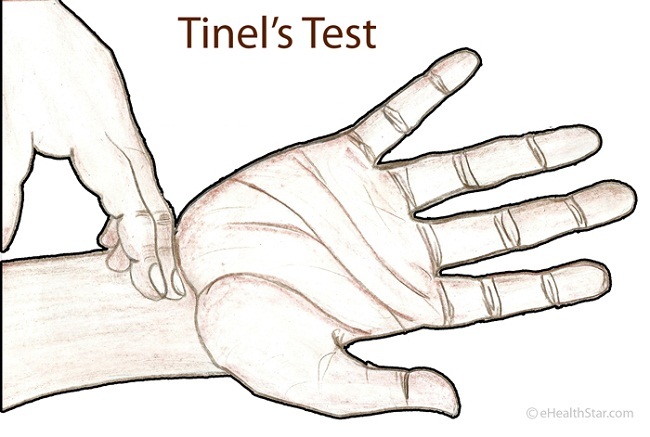 Special testing for carpal tunnel includes tapping on the nerve at Guyon’s tunnel eliciting tingling (called a positive Tinnel sign). Other provocative tests for cubital tunnel (to differentiate compression at the elbow from Guyon’s canal) include pressing on the nerve at the tunnel or flexing the elbow (positive elbow flexion exam). Importantly, the surgeon may look for negative signs including neck compression (Spurling exam) or thoracic outlet or pronator syndrome. 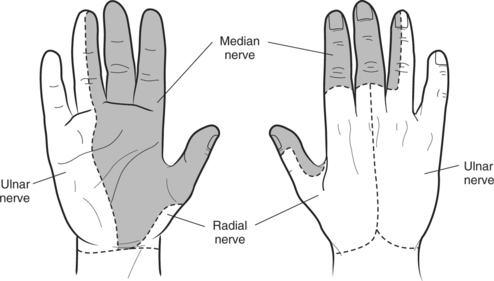 Tapping on the ulnar nerve at Guyon’s canal reproduces symptoms of tingling in the small and ring finger. Non-surgical treatment is typically indicated early in the disease or if the symptoms are mild. Nonoperative treatment is typically more effective in these situations. Activity modifications may be helpful if the patient has vibratory exposure or repetitive hand gripping or trauma. Bracing may be utilized by your surgeon and is typically utilized at night for most patients. If symptoms are controlled by these measures, no further treatment is indicated. If the patient’s symptoms persist, despite nonoperative management, surgical treatment is the next logical step—called a Guyon’s canal tunnel release. All surgical management is centered on decreasing pressure on the ulnar nerve at the tunnel. Surgical treatment can be performed as an outpatient surgery, typically using regional anesthesia. 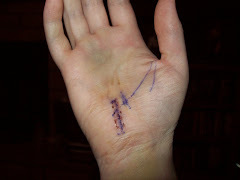 A small incision is made on the inside portion of the wrist and hand –and the roof of the cubital tunnel is released—relieving pressure on the nerve. 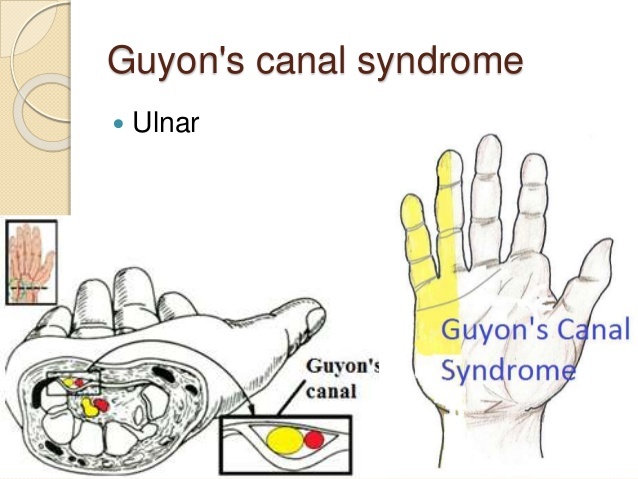 Improvement in sensation may occur faster in Guyon’s canal release than in cubital tunnel syndrome However, Night time sleeping is typically the first symptom to improve. 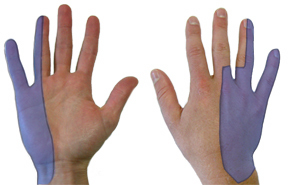 Improvement of feeling in the digits moves from the site of incision and marches distally over time. The rate of improvement and overall recovery are inversely related to the severity of nerve pinch and its duration. Pain and discomfort decrease over time after surgery. Improvements in sensation and strength may continue up to 18 months after cubital tunnel surgery for severe cases. Hand therapy is typically not required after cubital tunnel surgery.